Despite the impact STEM enrichment programs can have in engaging student interest and understanding of STEM, many schools struggle to offer hands-on opportunities because they lack funding, coaches, and other forms of support. By providing resources for STEM robotics programs to high-poverty schools and other organizations that reach underserved, underrepresented, and vulnerable students, the FIRST® STEM Equity Community Innovation Grant initiative has identified strategies to help any school open STEM pathways for students. Success in our modern economy demands a wide set of skills, including STEM knowledge, digital literacy, leadership, and strong problem-solving and team-building abilities. All students need access to opportunities to develop these highly adaptable skills early and often, so they’re better prepared to take on challenges and opportunities throughout their lives and careers and reach their full potential. High-quality STEM learning and engagement opportunities can be a game-changer for young people in disenfranchised communities who might otherwise not have access to pathways to the fast-growing STEM economy. A January 2018 report from the Pew Research Center finds that more than 17 million people in the U.S. are now employed in science, technology, engineering, and math (STEM) occupations, an increase of 79 percent since 1990. Less than half (47 percent) of fourth graders at high-poverty schools do a hands-on experiment once per week, compared with 61 percent of students in low-poverty schools. 52 percent of high-poverty schools offer a statistics class, while 88 percent of wealthier schools do. Only about a quarter (26 percent) of high-poverty schools offer computer science classes, compared with about 62 percent of low-poverty schools. In 2016, youth-serving STEM education nonprofit FIRST launched a new initiative to address inequities in STEM, the FIRST STEM Equity Community Innovation Grants. Supported by generous sponsors and donors, grants are awarded each year to schools and other community organizations throughout the United States and Canada that serve young people whose access to STEM education and enrichment might otherwise be limited. The grants, which range in size from $5,000 to $50,000, enable educators to provide underserved, underrepresented, and vulnerable students with hands-on learning opportunities and outlets for creative problem solving through FIRST programs. K-12 FIRST programs use team-based, mentor-guided robotics competitions to create an inclusive experience, where young people can build self-confidence, STEM knowledge, and a thirst for lifelong learning, helping students build a foundation for a brighter future. Students at the Early Learning Center in St. Martinville, Louisiana, work on their FIRST LEGO League Jr. model. The effect on many of the students, teachers, schools, and communities who received grants, which provided funding and resources for training coaches, purchasing materials, and removing other barriers, has been transformative. In one school system in South Los Angeles, teams of young people who had never worked with robotics before learned to work together, solve challenges, and compete in tournaments. In a residential school for vulnerable youth in Louisville, Kentucky, field trip visits to local companies and a science center introduced students to STEM careers. Beyond anecdotes, the results can be measured in academic and social progress. In findings from an evaluation, over 90 percent of team coaches indicated gains in STEM and 21st century skill outcomes for youth participating in FIRST programs through the grant. Nearly all coaches reported that the programs gave students the opportunity to make important team decisions and be team leaders, that students learned to work well together, and that students had a chance to learn about careers in STEM. Bringing in FIRST programs didn’t just positively impact students. Teachers also gain skills, confidence, and learning tools that they might not otherwise have had. Michael Kurinsky, who works with teachers at about 25 schools throughout the Compton Unified School District, explained, “I think there have been multiple impact points. One, and this is especially true for teachers who coached FIRST® LEGO® League Jr. (K-4) teams, is that it has made STEM more accessible to those who maybe shied away from it previously. Two, I think it has increased capacity for leadership. Teachers are developing skills they had previously rarely used, and they are finding niches and roles — opportunities for leadership — at their sites. Three, in some cases it has reinvigorated their passion because they are providing students with opportunities that may have not previously existed at their school site.” Kurinsky added that some teachers within his system have applied the FIRST Core Values — which emphasize discovery, innovation, impact, inclusion, teamwork, and fun — to their regular classes. Beyond that, FIRST provides a range of tangible and intangible benefits to the teachers who participate. “Many of our teachers enjoy the competitive nature of FIRST programs. For others, it's an opportunity that they never had when they were in school. The teachers in our district coaching FIRST programs want what's best for students, and they see these programs as improving the educational outcomes of our students,” Kurinsky said. FIRST LEGO League Jr. students build and program their model in McLoud, Oklahoma. Through the grant partnership with several schools, FIRST has identified key factors that resulted in starting and sustaining successful robotics programs. FIRST works with teachers, administrators, families, students, and communities to remove barriers and level the playing field so all students have the opportunity to participate, learn, grow, and thrive. The following strategies can help any school successfully provide quality STEM engagement programs to their students. In-person and digital learning experiences and resources give teachers confidence that they can coach robotics programs and help new teams encounter fewer barriers. As coaches and mentors to FIRST teams, teachers are the linchpin to a successful hands-on STEM program. They provide real-world context, guide learning, and encourage students to step outside their comfort zone and work together to solve problems. Identifying and training coach candidates can be challenging for schools, especially in under-resourced communities where educators are already overburdened, and parents may not have the time or resources to get involved. Students at Boys and Girls Haven in Louisville, Kentucky, build a robot for FIRST Tech Challenge. FIRST STEM Equity Community Innovation grantees provide new or expanding teams with the resources to reach out to new coaches and empower them to create diverse, inclusive, and equitable teams. All teachers had access to the free “Strategies for Inspiring Success for All” training modules, an online course from FIRST that includes specific strategies to support community outreach, student participation, persistence, engagement, and success. Compton Unified School District worked with principals to identify teachers as coach candidates, then supported them with FIRST Certified Professional Development, a two-day learning experience for teachers to acquire or strengthen their facilitation skills for project-based learning curriculum and 21st century skills such as creativity, problem solving, and teamwork in an active learning environment. The American Institute of Aeronautics and Astronautics (AIAA), which had previously established successful FIRST programs in mostly affluent schools throughout the Florida Panhandle, sent coaches from existing FIRST® LEGO® League (grades 4-8) and FIRST LEGO League Jr. (grades K-4) teams to remote areas to meet with new coaches and prepare them to lead their teams. Through the grant, AIAA was able to establish 55 FIRST LEGO League and FIRST LEGO League Jr. teams in high-poverty schools across the Florida panhandle. By allying with other organizations within the community, schools can bring in additional resources, leadership, and expertise to build their programs. No school exists in isolation. The more educators draw on support from other organizations and people within the community when starting or expanding FIRST programs, the more they thrive. For example, in McLoud, Oklahoma, the Pioneer Library System has created partnerships with McLoud’s public schools and the Kickapoo Tribe of Oklahoma to build its FIRST LEGO League Jr. program. With their 2017 FIRST STEM Equity Community Innovation Grant, the Pioneer Library System founded three new FIRST LEGO League Jr. teams. The “Power to Choose” (PTC) coalition in Calgary, Canada, hosted by the Alberta Women’s Science Network, worked closely with reserve schools and Indigenous leaders to connect with students. “Working with Indigenous people is different from working with the general population. Relationships are personal and your mechanism for reaching in is usually through a personal contact,” said PTC’s Wendy Hutchins. “We reached out to school board superintendents or curriculum specialists in two reserve nations and one in Calgary.” The task was complicated by the fact that over half of Indigenous people live in urban centers and attend regular public schools with non-Indigenous students. Hutchins’ group recruited through summer powwows and demos targeted to Indigenous youth. PTC also partnered with FIRST Western Canada for a one-day robotics workshop. This year they recruited 30 urban Indigenous youth and 15 adults for the workshop through the Calgary Stampede Foundation, which sponsors an annual festival and rodeo. Two thirds of the young people said they’d like to continue with robotics, possibly in conjunction with other Stampede activities. “Imagine 15 robots doing a Stampede barrel race,” Hutchins said. Funding for snacks, after-school travel, and other expenses can level the playing field and allow disadvantaged youth to participate meaningfully. High-poverty schools face distinct challenges with engaging students in after-school enrichment programs. Students can’t focus when they’re hungry, and parents may not have the time or resources to pack them snacks. Families may not be able to pick up their kids if they don’t have access to a car or if they work multiple shifts. FIRST STEM Equity Community Innovation grantees helped address these very basic needs by strategically providing transportation, food, child care, and/or teacher-coach stipends so that students and teachers could concentrate on robotics. A FIRST LEGO League Jr. team exhibits their Show Me poster and model at an expo in McLoud, Oklahoma. For example, St. Martinville, a small city in Southwest Louisiana, serves a population of students that is overwhelmingly African American, impoverished, disconnected, and rural. As part of a desegregation order issued by the federal government in 2016, the school district was mandated to offer students in the St. Martinville area education enrichment; FIRST was identified as a school turnaround strategy for the district. “We wanted to give students access to cutting-edge technology and opportunity they would otherwise not have been able to afford,” said Redell Louis of the St. Martin Parish School Board. In St. Martin Parish, FIRST teams were implemented at two schools as after-school programs. Participants were selected from a lottery of eligible students. Coaches/mentors were selected by each schools' principal. Teams from both schools meet two afternoons per week. Linking new teams with established ones can build skills and generate enthusiasm for new programs, while reinforcing experienced peers’ skills. Many schools find that starting new robotics programs is easier when they can tap into the expertise of students and coaches from more experienced teams. For example, students from Boys and Girls Haven, a residential school in Louisville, Kentucky, attended a local FIRST® Tech Challenge event to network with peers from other teams. One of those teams, the Electric Legends, later visited their campus to share their experience and hold a friendly scrimmage. 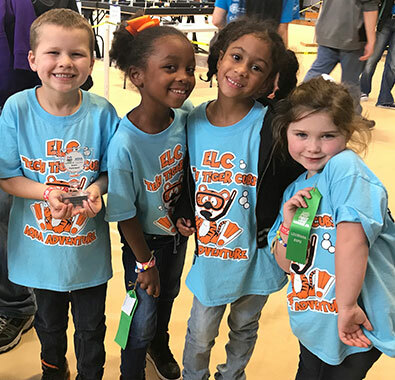 Educators at Gwinnett County Public Schools in Norcross, Georgia, have tapped into near-peer mentoring as they use a STEM Equity grant to extend FIRST LEGO League teams to every elementary school in the district. This year’s award also enabled two middle schools to bring FIRST Tech Challenge (grades 7-12) to their seventh and eighth grade students for the first time. A FIRST LEGO League team from Compton Unified School District competes in California. William H. Nye, who oversees the STEM academy at Gwinnett’s Meadowcreek High School, explained sharing knowledge has been fundamental to his school district’s success. At a kick-off breakfast, prospective coaches and mentors met with the district’s FIRST® Robotics Competition (grades 9-12) team and volunteers to learn about robot build, design, and coding. Soon after, students, coaches, and mentors all attended a “Robotic Saturday” event, where teams worked on their robots, practiced coding, and reviewed judging rules. In addition to these introductory events, the middle school program is integrated with the high school FIRST Robotics Competition team through “Meadowcreek Colts to Mustang,” an intern program which assigns high school students to FIRST LEGO League Jr., FIRST LEGO League, and FIRST Tech Challenge teams. The interns support the students and coaches, creating a sustainable pipeline of motivated and driven students of robotics and coding into the district’s “School of STEM” pathway programs and the community. This pipeline extends beyond the FIRST programs into the community. Nye is very proud that several of his robotics students have continued their work by designing and installing a FarmBot in a community garden. “The grant has enabled us to bring students, parents, coaches, and communities together in a true learning community,” he said. FIRST STEM Equity Community Innovation Grants level the playing field for disenfranchised communities and students, giving young people the chance to develop lifelong problem-solving and team-building skills, as well as STEM skills in engineering and coding. FIRST STEM Equity Community Innovation Grants reached 2,336 students on 308 teams during the 2017-2018 season. These programs reached many students who might otherwise not have had access to STEM learning opportunities: 80 percent of students were economically disadvantaged, 47 percent were girls and young women, 31 percent were African American, and 30 percent were Hispanic and Latino. Nearly all coaches in these programs reported significant improvement in STEM learning, interest in STEM careers, problem-solving ability, and leadership and teamwork skills by implementing FIRST programs. Coaches reported that, compared to before the program was implemented, students are more likely to accept input from others, to persevere through difficulties, to accept failure as part of learning, and to ask more questions about a problem. At FIRST, we are committed to bring our programs to the students who can benefit from them the most. We’re constantly developing new strategies to create greater, more equitable access, and to help every child succeed. For more on our commitment to Equity, Diversity, and Inclusion, visit firstinspires.org/diversity. FIRST Equity, Diversity, and Inclusion sponsors include Apple, Arconic Foundation, Qualcomm Incorporated, Bosch, Caterpillar, Cisco, Cognizant, The Dow Chemical Company, Fidelity Charitable, GM, GitHub, John Deere, Verizon, and individual donors, among others.